Tintypes recently discovered in the Ada Lee Shook Collection. Last year I was deep in the process of cataloging the Ada Lee Smith Shook (1928-2009) Collection. 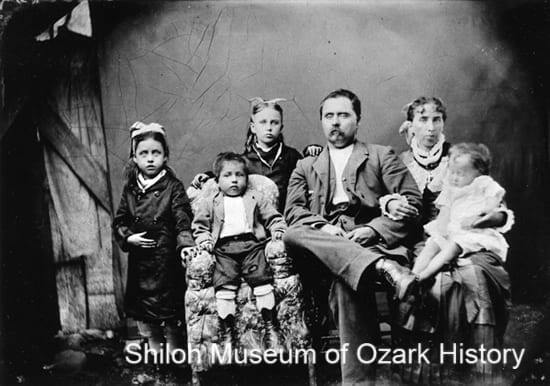 Ada Lee’s ancestors were among the first to settle in Northwest Arkansas. I worked up a very basic family tree, found spouses, divorces, deaths of loved ones, births, graduations, lifelong friendships, and all the usual highs and lows found in a lifetime. I became so attached to her and her family, it was sad to watch them age very quickly through the thousands of photographs. In this case, I did not have the luxury of watching it occur in real time, but over the course of a few months. When I completed this project, glutton for punishment that I am, I accepted the challenge of going through three more collections donated to us by Ada Lee in the years leading up to her death. We found a treasure trove of photos loaned for our History of Washington County (published by the Shiloh Museum in 1989). Many are original photographs and there is also a lovely set of tintypes. With this batch of photos, I have now been introduced to a whole new branch of Ada Lee’s family tree. But a mystery began with two tintypes slid between mountains of photos in envelopes and boxes. 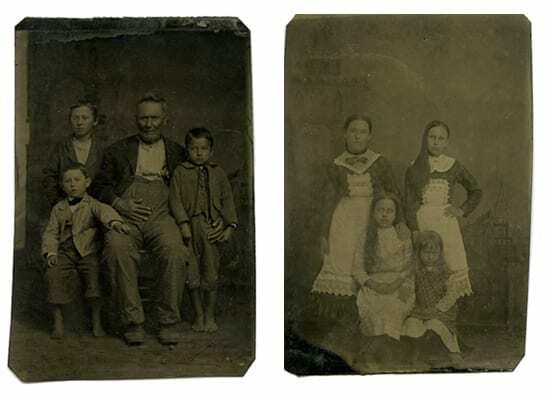 The tintype on the left was familiar, as we have a copy of the image in our photo collection. 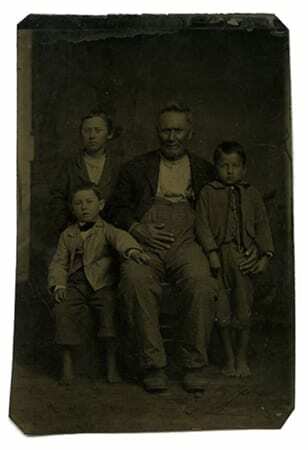 It is George Washington Vaughan (1813-1888) with his grandsons. 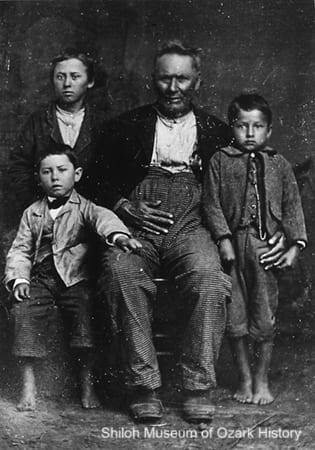 We knew the name of only one grandson in the picture—Albert W. Bevers—who was reported to be the boy on the right. 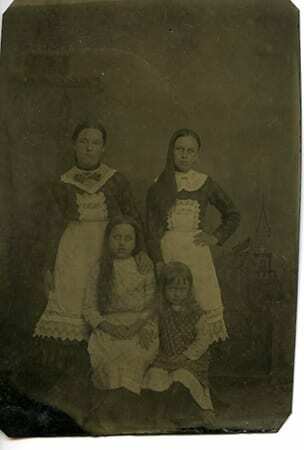 The second tintype, showing four unidentified girls, appears to have been taken on the same day as the Vaughan tintype. The rapture of discovery was put on hold while I worked up a more intensive family tree in a tentative hope we could come up with IDs for the girls in the second tintype and perhaps the boys with George Washington Vaughan. Based upon clothing and an age estimate for Albert W. Bevers, the previously cataloged photo had an estimated age of early 1880s attached to it. Keeping that in mind, we checked the dates for all of George Washington Vaughan’s grandchildren and compared those against the estimated date of the image and the guesstimated age of the children in the images. And let me tell you—when historians do math, it is a hoot! I located other photos of the families involved (see two below) and we began the process of elimination. After studying photos and birthdates of George Washington Vaughan’s grandchildren, we postulated that the children in the tintypes were those of two daughters of George Washington Vaughan—Margarett Louisa Vaughan Fitch (1838-1926) and Ada Ann Isabelle Vaughan Bevers (1851-1943). While there are several grandsons that could possibly be the other two boys in the George Washington Vaughan and Albert Bevers tintype, we think the children came from the Bevers and Fitch families and were not a hodgepodge of children belonging to the siblings of Margarett Vaughan Fitch and Ada Vaughan Bevers. We now believe these are the granddaughters of George Washington Vaughan. George Washington Vaughan and grandsons. As for the boys, we believe they are, front row, L-R: Lemuel Washington Fitch (b. 1876), George Washington Vaughan, and Albert W. Bevers (1877-1964). Standing in back is William Byron Fitch (1874-1893). I was able to locate an image of another grandson, Catlett Franklin Fitch (1871-1948), but am almost certain he is not pictured, although it is possible. I feel sure about the identifications of Albert and Ada, because in the course of cataloging this collection I watched them grow from children into elderly adults. The other children I can only speculate on. Until someone brings in a photo with IDs, we will never know for certain who they are. Moral of the story: ID your photos early, in detail, and while you still remember. Do not assume that decades later your children, grandchildren, or great-grandchildren will know who these people are. 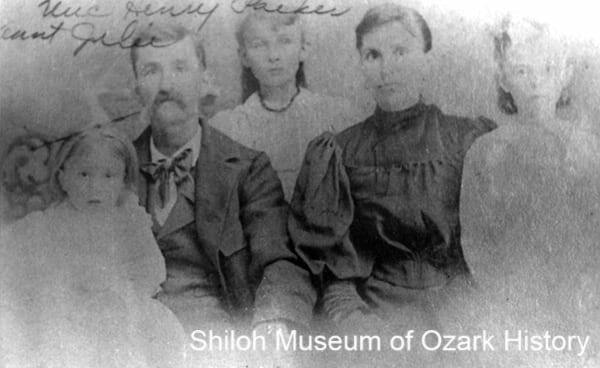 Rachel Whitaker is the research specialist at the Shiloh Museum.